Here’s how I sharpen my Sardinian pocket knife. The whole sharpening process took around 10 minutes. 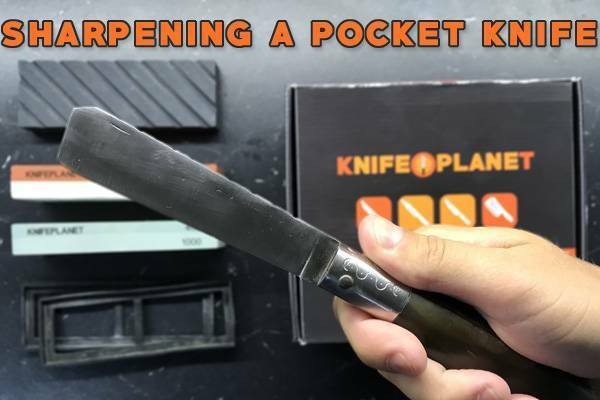 As you can see from the video, you can easily take care of your dull pocket knife with a water stone… But there are a couple of important things to keep in mind. 1. What steel is your pocket knife? Peter wrote a really nice article about this: check out this paragraph. Essentially, you need to understand the type of steel used for your knife, to understand the hardness of the blade and figure out what angle you should choose to sharpen it at. You can sharpen your knife at AROUND this angle. If the steel of your pocket knife is hard, lower your angle: move the blade towards the stone. Basically make it so there is LESS space between blade and stone (that is, a 10-15 deg angle). Try again. Start on a low grit coarse stone, a #400 grit will do. Try to understand if the angle is more or less 15-20 degree. You can do this by simply placing your pinky finger underneath the blade. That’s more or less a 15-20 degree angle. It’s important to maintain the angle MORE OR LESS constant while sharpening. If you’re just starting out, try to check from time to time, and see if your angle is more or less the same while sharpening. Check for a burr really well before switching sides. It’s a tiny metal burr that your feel on the opposite side that you’re sharpening. 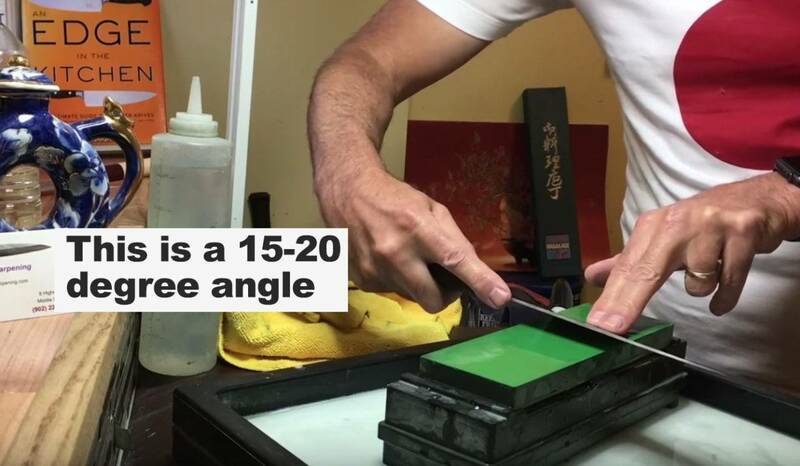 You can’t get it wrong, just pass your finger on the other side of the blade, you should feel it after some time sharpening with a good amount of pressure, at more or less a steady, 15-20 deg angle. No burr = No sharp edge. Remember this! Some knives, like the one in the video above, are really easy to sharpen. A couple of minutes of heavy pressure and the burr was already there. Other knives require more patience. Just play around with the angle and the pressure, you’ll get there sooner or later. So much choice… we’re all tempted to buy ANOTHER water stone! 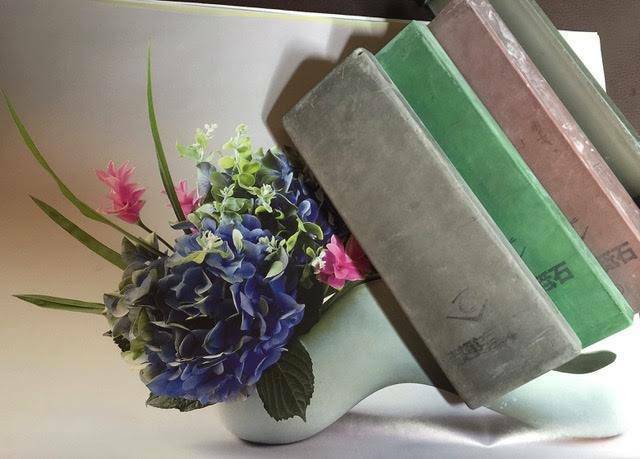 There are many sharpening stones available on the market. I usually recommend water stones to start sharpening pocket knives. These types of stones are made of abrasive materials, and only water is needed to “activate” their sharpening properties. As I mentioned in the beginning of the article, I recommend keeping it simple. You don’t need many stones to start out, you definitely don’t need the best and most expensive stone to put a good edge on your EDC knife. Ideally, you could start sharpening your pocket knife on a #400 grit water stone and regulate sharpening pressure accordingly. We’ve put together the KnifePlanet Sharpening Set, which offers 4 grits and a flattening stones, basically all you need to start out. If you’re looking for a quality water stone, the Naniwa Chosera #400 is a great choice, and so are the Shapton Glass stones. For a cheaper option I also recommend a KING water stone. Generally speaking, if you have a old water stone at home, 400-1000 grit, I really recommend you to use that first. Learning the technique is not so difficult, but it’s the essential first step to start sharpening your pocket knives. I hope this article will help you get your pocket knives RAZOR sharp! You’ll soon understand that it’s not so difficult. Just have patience and sharpen a couple of knives, you’ll soon understand how to have a nice sweeping motions on the stones… checking the sharpening angle on your pocket knife won’t be so important anymore; in other words: the sharpening process will become a natural action. Also very enjoyable 🙂 Keep trying and if you need any help, don’t hesitate do get in touch.